In just a few years Lottoland has gone from a small start-up run by a handful of people to a recognised leader in the field of lottery betting, with hundreds of employees spanning multiple continents. In total more than a quarter of a billion euros in prizes have been paid out to lucky winners throughout the world. 2019 sees yet another milestone for Lottoland, as the company passes the 9 million customer mark. When it comes to rapid growth, few companies can rival Lottoland. From zero to nine million customers in just over five years is a remarkable achievement. Is it any wonder Lottoland has been dubbed "one of Europe's fastest-growing companies"? It seems like only yesterday we were celebrating our millionth customer. The customer in question was Jan, a father of two who lives just outside of Frankfurt. Back in May 2015 he got to experience a taste of the lottery winner lifestyle when we arranged for him to drive a top-of-the-line Porsche 911 for the weekend. Less than a year later we had three million customers, and now, ten months later it was five million and now we are up to an incredible 9 million. In other words, if Lottoland was a real country, it would have a higher population than the Republic and Northern Ireland combined! April 2013: Lottoland launches with a gaming license from the government of Gibraltar. June 2014: Chris Tarrant joins the company as brand ambassador. May 2015: We celebrate our one millionth customer while prize payments exceed €100 million. November 2015: Lottoland wins "Rising Star" and "Best Alternative Operator" at the EGR Awards in London. December 2015: Lottoland launches in Australia, lucky Lottolander wins €4 million on El Gordo. January 2016: Lottoland offers its largest jackpot, the record-breaking US PowerBall which grows to over €1.4 billion. February 2016: Our second-biggest winner scoops €14 million, later comes to visit us in Gibraltar. March 2016: Lottoland celebrates passing the three million customer mark. April 2016: Lucky Lottolander wins our single largest jackpot to date, worth €22 million. May 2016: Official launch of Lottoland Ireland as company is granted a new Irish gaming license. December 2016: An unforgettable Christmas for Lottoland customers - half a million euros won on El Gordo and £343k on EuroMillions. 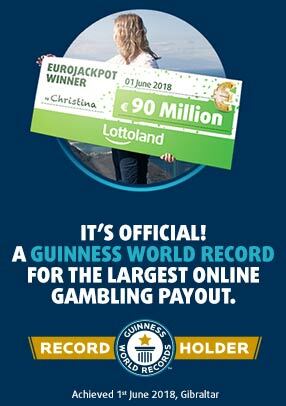 June 2018: A new record-breaking Lottoland winner takes home €90 million from EuroJackpot. August 2018: Milestones keep getting smashed as Lottoland's tally rises to 8 million! February 2019: Now there are over 9 million Lottolanders out there. Today, more than 350 employees from 32 nations are working on preparing the lottery experience for you in a contemporary and innovative way. From Australia to Malaysia to Portugal, we live and breathe lotto every day, always looking for perfection. In total, more than 1 billion euros have already been paid out to lucky customers. We don't care much about borders, we've had winners from Sweden, England, Slovakia, Brazil, Germany and of course Ireland too. We have recently celebrated our fifth birthday, but despite the young age we have not only achieved a lot, but also learned a lot. Especially from you. Therefore, we will continue to offer the biggest lottery betting opportunities, the best scratchcards and the most exciting games for you in the coming months and years. The dream lives on, and of course you take the lead roles. The entire team from Lottoland says thank you very much and wishes all of our Lottolanders every success for the future.